Are you seeking for ways and means to make your windows pristine once more? Do you want to know how to skip unpleasant tasks like window washing without lifting a finger? You have chosen the right assistance – the adepts of window cleaning in Shepherds Bush will deal with this matter in no time. Your windows alongside their framework and sills will look perfect, we guarantee that! You will no longer need to give up your free time – the results of our commitment will absolutely delight you. Our services blend highest quality with reasonable price rates, so don't wait – request an estimate now to save time, energy and money! We also provide our professional services in nearby areas: White City, Bedford Park, Notting Hill, Hammersmith, Willesden. You can enjoy perfectly looking work environment with the help of the experts of commercial window cleaning. You can count on our first-class services for all types of business premises. For instance, if you have a small shop, we can thoroughly wash its windows by using water fed extension pole equipment – it allows us to go as high as the fourth floor. If you require pristine look for the glass panes of a tall business property in London and the neighbouring areas, we will make use of our rope access gear. In both cases, you will get perfect results in no time. You can count on the team - they are the true specialists of window cleaning. They all have passed through diverse training sessions, so you can receive top-notch help for all glass surfaces kinds. What we can clean includes: small, double, garden windows, bay or sash windows, patio doors, French doors, conservatories and skylights. Your building can be improved quickly with our aid. Call us every time you need great window cleaning for your home or office. We use exceptional techniques of window cleaning to make sure you will have superb end results. With our water fed pole cleaning system, high pressure cleaning and rope access team, you can rest assured that your property's glass surfaces will be crystal clear. Furthermore, your house is in good hands – the cleaners are absolutely insured and comprehensively trained. The water fed poles are connected to water supply reservoirs in the vehicles, while our rope access guarantees safety – even when we clean tall buildings. You can get advantage from these options immediately – dial 020 3746 3113! 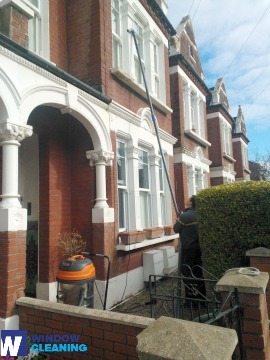 Take advantage of our home window cleaning in Shepherds Bush – we provide great services for your home on attractive prices. We use purified water to clean the windows inside and out. We stay safely on the ground and clean with water-fed pole technology. Find us now - ring 020 3746 3113 or just fill in our booking form. Our staff will help you request a window cleaner and answer all of your questions. You will appreciate the results of our domestic services, we guarantee that!